THRUSTOR has a longer pedigree than the name hints. The band´s mainstays, brothers Phil and Tony Sardo made their first mark with SCEPTRE back in 1983, featuring on the infamous Metal Blade Records compilation “Metal Massacre Volume 4”. Other luminaries of that CD were TROUBLE, LIZZY BORDEN, ABBATOIR and ZOETROPE… As they transformed into SARDO both support gigs with the likes of DARK ANGEL, and headliner shows followed betwixt 1985-87. As SARDO combusted the brothers breathed life into THRUSTOR, and released their first full-length “Night of Fire” in 1999. Since 2006 the band has been remixing that album with world-renowned producer Neil Kernon (QUEENSRYCHE, NILE etc. ), as well as commencing n this album back in 2010. Neil Kernon once again involved, mixing was handled by Mathew Prock of Area 44 Music. The brothers have also teamed up with drummer Tomasz Pilasiewics. The overall feeling is that of old school thrash meeting up with the laser-sharp technical edge of MEGADETH. The techno-thrash approach is always there, not least in opener “Struck by the First Stone”. The refrain is dead set in the early eighties, with a killer chorus and all. Somehow the band “sounds more” than a trio. 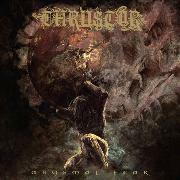 The next typicality is the groovy and less subtle thrash barnstormer, like the aptly titled “Brutal Assault” or “Shroud of Blasphemy”, with an approach that might be best described as VENOM goes techno-thrash. But as a band of ideas and devotion there is also bits of doom and underground-feeling (“Screws to the Skull”), the exquisite melody and atmosphere of the title track, the dynamic bass of Tony, and a machine-like drumming courtesy of Tomasz. If you miss old techno bands of the Under One Flag era, but still like a bit of melody and the odd MEGADETH-precision and (even) squeezed vocals, than this is the disc to buy.